Jaime Fernandez was the hero for Unicaja Malaga in the overtime win over Real Madrid and was also named ACB Round 19 MVP. Unicaja got back on ACB’s win column beating Real Madrid in overtime. Jaime Fernandez sank the winning three-pointer in extra time raising his ranking total to 34. 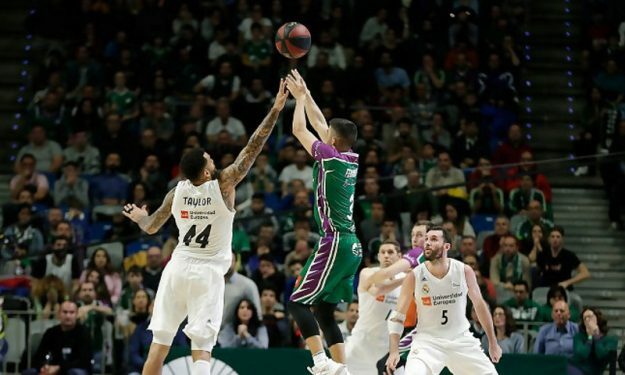 Racking up the highest PIR among the players of all winning teams in the Spanish League’s Regular Season Round 19 clinched the MVP of the Week title. The 25-year-old guard finished Sunday’s game with 27 points making 5/8 shots beyond the arc. He also dished nine assists and was fouled in seven occasions. His magnificent performance including his winning three secured him the Liga Endesa MVP of the Round honors for the second time this year and in his career.